Hello Fabricworms! Recently, one of our gal pals, Arleen Hillyer, released her debut collection: Tall Tales! We have been waiting a long time for this collection and our patience has paid off. Just look at those prints and those colors! This week we have decided to giveaway two free yards from this fantastic collection. Winner gets to choose which print(s) and substrate(s) they would like to receive. Did we mention this collection comes in quilt weight, double gauze, knit, and canvas. Enter to win! This giveaway ends on Tuesday 7/26 @ 12 am PST. The winner will be contacted shortly after by email. The winner will be chosen randomly by Gleam. I love the phases of the moon print! Thanks for the chance! 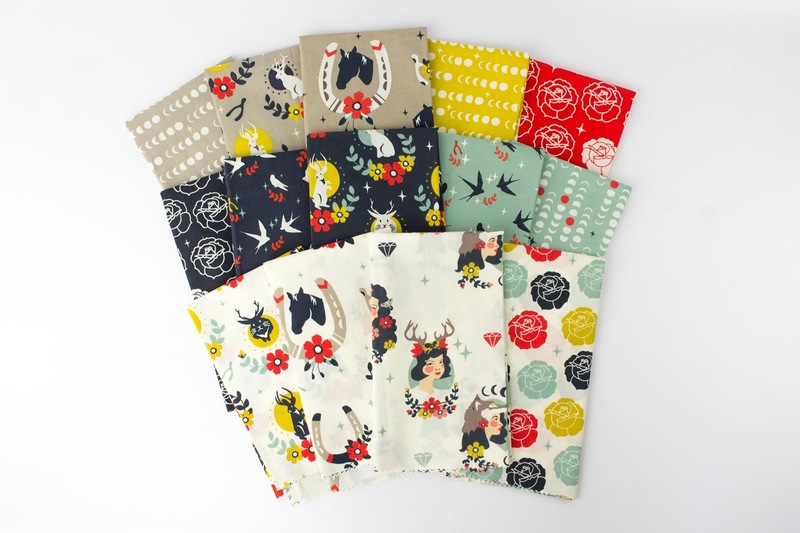 I love the new tall tales prints and would love to win some cotton for quilting. I make modern baby quilts and sell on my etsy store. I love your shop and the fabrics you select to sell! The moons and the horseshoes are my favorites. Great giveaway! I think the comment prompt about what we would make with fleece has been stuck in there a while! :-) I would use this fabric to make something special for my daughter who starts Kindergarten in September! With fleece I would make some pajamas, not sure what my favorite color is! Not sure what I would do with fleece...probably some pjs? Thanks for the chance to win! Oh yes! Love them all! Such a neat collection! Thanks for sharing! This would make a very nice Charity Quilt! I'm so impressed with the style and theme of this collection. And it's organic!! Bravo!! Shall I win I'd ask for knit and do a selfish sew. I love the teal phases of the moon fabric. It is so cute, and in all colors. I don't do much with fleece, probably a car blanket at best. I'm curious about double gauze fabric, though. thanks for the great opportunity to win such cute fabrics! I'm totally in love with the jackalopes! I'd make slippers from the mint green organic fleece. Fleece lounge pants! My favorite color is green, but the charcoal with green accents is so cute! I'd make a blanket for my niece. 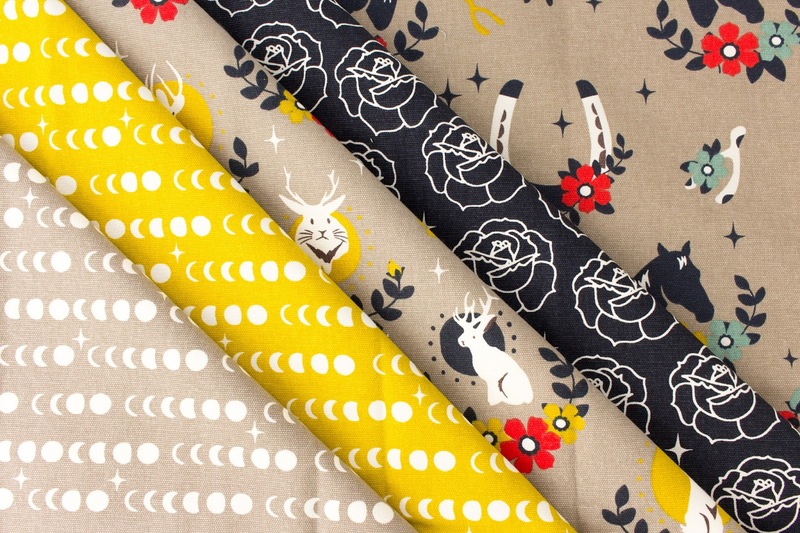 I'd use the jackalopes fabric. Omg, already have my prints and pattern picked out! Fabricworm always has such fun and funky fabric options, so no surprise I LOVE this line as well! Love them all! It will be tough to choose when I win! cute and funky prints....thank you for the giveaway! So cute! It will be hard to choose. A child's quilt would be my choice of project. I would love to make a dress out of these! These would make for some adorable little girl clothes! I'm a rabbit fan! Would love to have those jackalopes to add to a special log cabin quilt in the works!! I would love to do my new project (chemo hats) with those beautiful flowers prints ! Love the mind and navy in this line! Would make some fun tops or skirts. These are great prints, and would work with some coordinating solids in a dress for my little girl. Lov these prints, I would use them for a quilt. Just watching a Craftsy class on sewing with knits, so I have lots of new ways to use this fabric! Love the navy and dusty blue! I'd make a lap quilt in cheery yellow, for dreary winter days. Some really cute prints here. I love the roses!The fabrics are beautiful! I LOVE this collection, amazing. I use fleece to back my quilts. I like blue but any color is fine. I think I'd try to make a hat with blue fleece. This collection is absolutely adorable, and I'm just a little bit in love with the jackalopes! Love the moon print. And jackalopes! Oooo I would love to make a knee blaket for a friend in a wheelchair. Gorgeous colours, I'd make a baby quilt for my friends little boy..
To answer your question, I'd make purple pj's for my granddaughter! Love all the prints! I would use the knit fabric to makea wrap for my baby! I'd use fleece for making blankets for the kids. My favorite colors would be blues or grays. Thanks for the giveaway. Tough -- I am thinking the young kids would love a tiny quilt or two with the fabrics. I would make a baby quilt for my new grandson to be born in December. Right now I'm in need of a baby girl quilt so that's where 2 yards would come in handy. So beautiful. I'd love to use some of this for new throw pillows. A car quillows with a book or small toy pocket for my grandson! I hopped to you from Sarah, and am not sure if this is open to all bloggers. I am in New Zealand, and our granddaughter has a horse, so the quilting weight fabric with horse shoes would be perfect for me to make her something special. I need this fabric to make a dress for my niece. The horses are perfect! Beautiful Fabric!! Thank for the opportunity!! A baby quilt. Blue or pink. This site has the most adorable fabrics I have ever seen! I could spend all night here just dreaming up projects! I Love these prints so whimsical! Thanks for the give-a-way! Lovely fabric - Thank you ! !